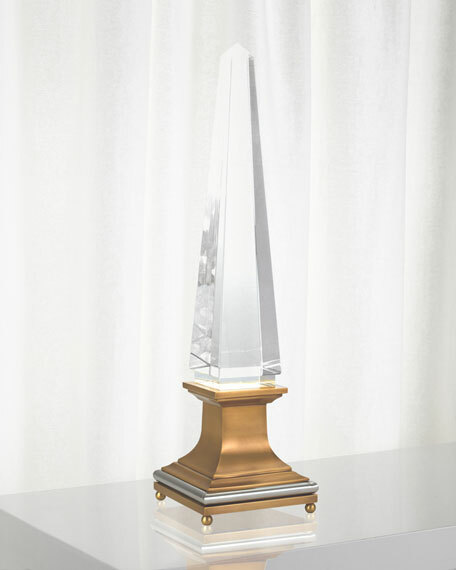 Crystal obelisk with stainless steel base, featuring brass and nickel finishes. Includes 6.5-watt, dimmable LED bulb; type A socket. 8' clear silver cord with rotary switch. Clean obelisk with glass cleaner. Dust base with dry cloth. Weight, 37 lbs. Boxed weight, 46.4 approximately lbs. Impressive and glowing, our illuminated crystal obelisk is definitely a show stopper! The solid crystal obelisk sits on top of a brass and nickel finished base with an LED bulb that illuminates the crystal beautifully.